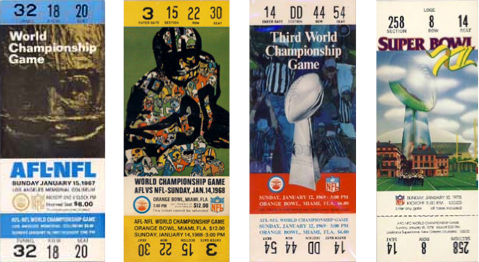 When it comes to collecting ticket stubs, one event stands out as king—the Super Bowl. Oh, there may be some swagger to a 1919 World Series stub, or a Chicago Bulls Game 6 from the 1998 NBA finals, but really: It all comes back to the Super Bowl. Sunday marks the 45th Super Bowl, but did you know there will be 126 versions of those 45 game tickets? Even in the first World Championship game, now known as Super Bowl I (see photo above, far left), there were three varieties: White ends, blue ends, and gold ends. That game was well short of selling out, so there are several on the market at any given time. The tradition of color-coding tickets has carried through to today, although newer stadiums have far more than three sections to designate. So, which Super Bowl tickets represent the Holy Grail for collectors? From a scarcity standpoint, Super Bowls II (above, center left), III (above, center right), and XII (above, far right) are considered to be in shortest supply. These were from years when tearing the ticket was de riguer. Now that bar code scanning is the de facto means of checking into a stadium, all Super Bowl stubs are considered Fulls. The practice of scanning began in 2003. That year they also tore the audit stub off, so Super Bowl tickets didn’t start remaining intact until 2004. Are wheelchair unused tickets more valuable or less, same with press box or field? I’m new at this and it looks like something that i would enjoy collecting so any information you could pass on would be appreciated. I also noticed some of the PSA tickets are in nice tight cases and some are in much looser ones causing the card to shift all over. “ ” Yes, they were trying to humanize black people, but also, as human beings, they just wanted to express themselves as artists.